Water quality tests near the Honouliuli Wastewater Treatment Plant's outfall near Barbers Point revealed bacteria counts exceeding national standards for recreational uses, according to the Environmental Protection Agency. The U.S. Environmental Protection Agency's call for an upgrade of one of the city's sewage treatment plants is "unreasonable, untimely, unfair and unnecessary," Mayor Mufi Hannemann said yesterday. The mayor said his administration has been "trying to correct what the EPA calls decades of neglect," with aggressive spending on sewer improvements islandwide and increases in sewer fees to pay for it. Public comment will be accepted until May 29. A public hearing is set for 6:30 p.m. May 15 at Kapolei Middle School, 91-535 Kapolei Parkway. Primary treatment: Screens out large floating objects such as rags and sticks, removes grit (cinders, sand and small stones) and uses holding tanks to settle out solid materials suspended in the water. Secondary treatment: Primary-treated waste water flows into another facility where a large portion of the organic matter in the waste water is removed by allowing bacteria to consume most of the waste's organic matter. But the city cannot afford to upgrade both its sewage collection system and its treatment plants at the same time, he said. Hannemann predicted financial difficulty for the city and "sewer fees of $300 a month in 20 years" for most residential users if Honolulu has to upgrade both its Honouliuli and Sand Island sewage plants to what the EPA calls secondary treatment. The EPA announced yesterday that it does not plan to allow the city a variance from the federal Clean Water Act, which requires treatment to a secondary level before discharging to streams, oceans, the ground or for reuse. The EPA's "tentative decision" on a variance request that has been pending since 1995 "reflects that the Honouliuli plant does not meet the Clean Water Act requirements," Wayne Nastri, EPA administrator for the Pacific Southwest, said in an announcement. Water quality tests near the Honouliuli plant's outfall near Barbers Point revealed bacteria in the water exceeding the EPA's national standards for recreational uses, according to an EPA explanation of its decision. The Honouliuli effluent also exceeds EPA standards for ammonia (nitrogen) and for the pesticide chemicals dieldrin and chlordane. Excess nitrogen can contribute to algae blooms, which can in turn affect other aquatic organisms, the EPA said. The EPA has granted waivers on a case-by-case basis for sewage plants that discharge to the ocean, but the number of such waivers has steadily decreased over the years. In the EPA region that includes California, Nevada, Arizona and Hawaii, just three sewage plants currently have those waivers -- Oahu's Honouliuli and Sand Island plants and one plant in San Diego -- said EPA spokesman Dean Higuchi. "We think what the EPA is doing here kind of underscores what we've been saying. Our sewage system has been neglected," said Jeff Mikulina, the Sierra Club's state chapter director, calling the primary treatment the city seeks to continue "1850s technology." "The fact the mayor is blaming the Sierra Club for the city's violation of environmental law is beyond words," Mikulina said. The Sierra Club, Hawaii's Thousand Friends and Our Children's Earth, which have jointly sued the city seeking sewer system improvements, "see our role in the community as the watchdogs, holding whoever accountable -- this mayor, the governor, the previous administration," Mikulina said. "We don't do it for political reasons. We do it for environmental reasons." Hannemann said in 2005-06, the city committed money for 115 miles of repair or replacement of pressurized sewer pipes, compared with just 17 miles of equivalent work in the previous decade. 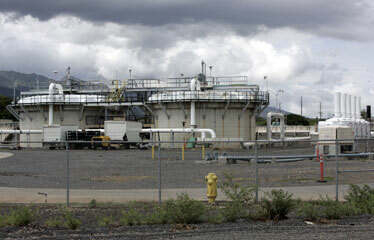 The mayor also disputed the EPA's allegations that the Honouliuli plant endangers the public health. "The bottom line is no one swims there, there's no danger to marine life and the water we drink is not impacted at all," Hannemann said. Public comment on the EPA ruling will be accepted until May 29 and at a public meeting May 15. Hannemann said he will urge his "own EPA -- environmental panel of advisers" of local engineers and scientists to testify on the city's behalf. He also urged the state Department of Health to "become an active supporter rather than a reactive bystander in this whole process." Health Department spokeswoman Janice Okubo said the state was not involved in the EPA decision to tentatively deny the city a waiver for the Honouliuli plant. Whether it will take a stance on the matter will depend on review of materials the city has provided the EPA, she said. "Our main concern is that all discharges comply with the law and protect the environment," Okubo said. The environmental groups believe federal funds and financing plans will help the city cover costs, Mikulina said.